Dr. Nambisan’s research interests are in the broad areas of marketing & organizational communication, social media and other digital technologies, innovation & entrepreneurship, and healthcare management. Her current work focuses on social media (and other digital) experiences and their impact on a) consumer/patient behavior and decision-making, b) entrepreneurial behavior and value co-creation, and c) health and mental well-being. Dr. Nambisan pursues highly inter-disciplinary research that draws from different fields. 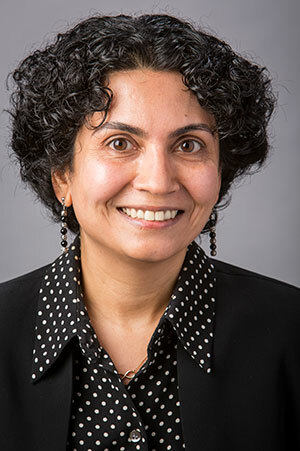 Her work has been published in premier journals such as the Journal of Business Research (JBR), MIT Sloan Management Review, Journal of the American Medical Informatics Association (JAMIA), Health Care Management Review (HCMR) and Health Expectations. She has also actively participated and presented in reputed academic conferences such as AoM, HICSS, ICIS, USASBE, APHA, and AMIA. Nambisan, P. (2017, November). Should Health Care Organizations Use Information Gleaned from Organization-Sponsored Patient Support Groups in Strategic Planning? AMA journal of ethics, 19(11), 1088-1095. Nambisan, P. (2017, June). Factors that impact Patient Web Portal Readiness (PWPR) among the underserved. International Journal of Medical Informatics, 102, 62-70. Nambisan, P. (2016, November). Social media data for assessing the impact of water quality of nearby waterways on people’s physical and mental health. Proceedings of the American Public Health Association 2016 Annual meeting and Expo, Denver, CO.
Rastegar-Mojarad, M., Liu, H., & Nambisan, P. (2016, June). Using Social Media Data to Identify Potential Candidates for Drug Repurposing: A Feasibility Study. JMIR Research Protocols, 5(2), e121. Nambisan, P., Gustafson, D. H., Hawkins, R., & Pingree, S. (2016, February). Social support and responsiveness in online patient communities: impact on service quality perceptions. Health Expectations, 19(1), 87-97. Nambisan, P. (2016, January (1st Quarter/Winter)). Entrepreneurial mindset of the healthcare workforce: Meeting the needs of the emerging healthcare market place. Proceedings of the United States Association for Small Business Entrepreneurs (USASBE) conference. Nambisan, P., Luo, X., Kapoor, A., Patrick, T. B., & Cisler, R. A. (2015). Social media, big data and public health informatics: Ruminating behavior of depression revealed through twitter. Proceedings of the HICSS -48 (Hawaii International Conference on System Sciences) conference. Nambisan, P., Luo, J., & Kapoor, A. (2014). Social Media and Big Data: Can tweet moods predict illness and hospital visits in a region?. Nambisan, P., Kreps, G. L., & Polit, S. (2013). Understanding Electronic Medical Record Adoption in the United States: Communication and Sociocultural Perspectives. Interactive Journal of Medical Research (iJMR), 2(1), e5. Nambisan, P., & Watt, J. H. (2011). Managing customer experience in online communities. Journal of Business Research, 64(8), 889-895. Nambisan, P. (2011). Evaluating patient experience in online health communities: Implications for healthcare organizations. Health Care Management Review, 36(2), 124-133. Nambisan, P. (2011). Health information seeking and social support in online health communities: Impact on patients’ perceived empathy. Journal of the American Medical Informatics Association, 18(3), 298-304. Nambisan, P., & Nambisan, S. (2009). Models of consumer value co-creation in health care. Health Care Management Review, 34(4), 344-354. Nambisan, P. (2009). Online health information technologies: Enabling service innovation in health care. Annals of Information systems, 5, 159-177. Nambisan, P., & Watt, J. H. (2008). Online community experience (OCE) and its impact on customer attitudes: An exploratory study. International Journal of Electronic Marketing and Retailing, 2(2), 150-175. Participant (2005) Organizational Communication Doctoral Consortium, ICA. Dissertation based work selected (2005, October) American Medical Informatics Association (AMIA) Annual Doctoral Consortium. Graduate Student Fellowship (2004) School of Humanities and Social Sciences, RPI. Fellow (2003) Annual Summer Graduate WebShop. Graduate Teaching Assistantship (2003) RPI. Graduate Research Assistantship (2002) RPI. Graduate Teaching Assistantship (2001) RPI. William W. Allen Scholarship (1996) College of Human Development, Syracuse University. Graduate Tuition Scholarship (1995) College of Human Development, Syracuse University.